Now Redmi Note 5 Pro users will enjoy the new Global MIUI 9 8.5.11 Android 8.1 OREO ROM on their phone. If you are the owner of the Xiaomi Redmi Note 5 Pro smartphone then from here you can download Redmi Note 5 Pro Android 8.1 OREO ROM. This new ROM comes with lots of new features like FullScreen Mode, New gestures, Dual 4G Mode (Dual Volte). The rom is stable and the battery performance of the phone is much better than the previous ROMS. We are using this ROM on our Redmi Note 5 Pro from last 3 days and the ROM is pretty good and the performance of the phone is too good. To install the Android 8.1 OREO ROM [MIUI 9 8.5.11] on your Redmi Note 5 pro all you need a TWRP custom Recovery on your phone and you will install the zip file on this rom on your phone. Here in this guide, we will show you how to install the Android 8.1 OREO ROM on your phone WITHOUT losing the data. 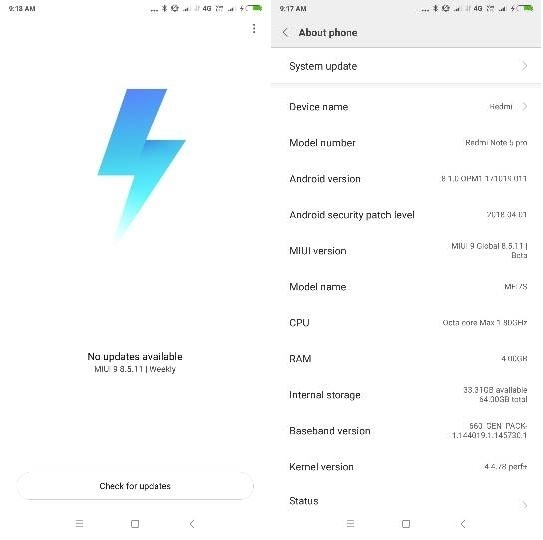 This the leaked version of MIUI 9 8.5.11 Global StablofROM based on the latest version on Android 8.1 OREO. So to flash this OREO rom on your phone, you need a custom TWRP recovery and the Stock recovery will not work for this ROM. But before that, you have to unlock the bootloader of your Redmi Note 5 Pro. And follow this guide to install the TWRP recovery on Redmi Note 5 Pro, the process wi simple and take only 2 to 3 minutes to install the TWRP recovery. Warning: Technobuzz.net is not responsible for any damage that might happen to your phone during this process. So let’s get started and download MIUI 9.5.6.0 Global Stable On Redmi Note 5 Pro. Make sure that your phone has at least 50-60% charged to prevent the accidental shutdown during the flashing process. So let’s get started and download Redmi Note 5 Pro Android 8.1 OREO ROM [MIUI 9 8.5.11]. As we mentioned earlier that this is Global Stable leaked MIUI 9 Recovery ROM and not the fastboot ROM and you have to use the TWRP recovery to flash this ROM on your phone. Below is the zip file of the Android 8.1 OREO ROM [MIUI 9 8.5.11]. Download and save the Zip file on your phone’s internal memory and follow the guide to install the same on your Redmi Note 5 Pro. Follow this guide to Unlock the Bootloader of Your Redmi Note 5 Pro. Install TWRP custom Recovery on the Redmi Note 5 Pro. Make sure that your phone has enough battery to complete the whole process. Above 70%. 1. Once your Phone bootloader is unlocked and TWRP is installed. Download the OREO ROM zip file form the above mention link. 2. 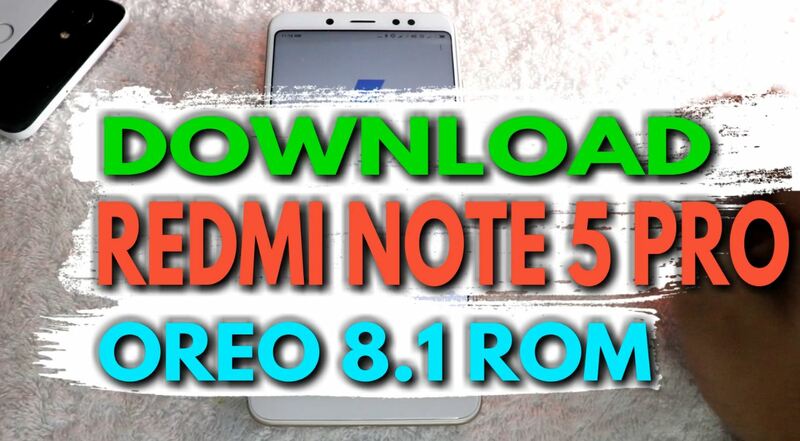 Save the Redmi Note 5 Pro Android 8.1 OREO ROM [MIUI 9 8.5.11] zip file on your phone’s internal memory and remember the location of your file. 3. Now time to boot your phone in TWRP mode. Switch off Your phone first and Hold the Volume Up + Power button. 4. Now Redmi Note 5 pro will boot in TWRP recovery mode. 5. Tap on the Wipe > Advanced Wipe and Wipe Cache/Dalvik Cache. 6. After that Tap on the Install Option and locate the OREO ROM zip file and Swipe to Confirm Flash. 7. Now the Global Stable 8.1 OREO ROM will flash on your Redmi Note 5 Pro. 8. After all the process gets completed then simply click on Reboot system and keep patience because it will take around 15 minutes to make the device booted up once the updating process gets completed. Voila! Now you successfully updated your Redmi Note 5 Pro with the Global Stable version of Android 8.1 OREO ROM [MIUI 9 8.5.11]. Hope you like this guide to update the Redmi Note 5 Pro with the latest MIUI 9 Android 8.1 OREO update. If you have any question in your mind, then leave the comments below.